Every person should be able to feel safe in the knowledge that the building they are entering, or using, and underground transport systems will not put them in danger or become a trap. For this reason, fire can never really be completely ruled out. The correct preventative measures and components can help to minimise this risk and restrict the damage caused by fire. Fire safety components and systems help to minimise the risk of fire and prevent fire and smoke from spreading allowing valuable time. With the TROX Declaration of Performance (DoP) and the operating and installation manual customers are given a complete documentation package which ensures that TROX fire dampers can be used safely. The Construction Products Regulation aims at harmonizing the technical specifications for construction products. 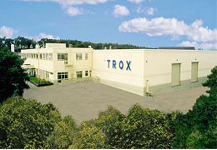 The TROX feature article “New Harmony for European Markets" explains what is special about the new regulation and uses examples to explain the most impartant facts and names. In the past, openings for the installation of fire dampers in solid walls or ceiling slabs had to be of the exact size; only minimal tolerances were allowed, if at all. This has changed with fire batt solutions as they provide a new level of flexibility. With a fire batt, fire dampers can in fact be installed in openings that are much larger than the fire damper casing – the perimeter gap may be up to 400 mm wide. 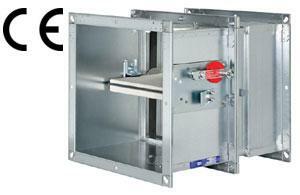 It is no longer a strict requirement that an installation opening fits the fire damper exactly. Installation guidance shown via our video.